My baby is THREE! She is sweet and spunky and was so much fun to celebrate! Between the two kiddos, we have hosted five parties and this was our smallest one yet. We had our parents and siblings over for dinner and dessert with a lot of floral and a little Minnie Mouse on the side ;) I am planning to use all the decorations from the party for E's big girl room makeover! The Minnie Mouse felt ball garland is from the Fickle Felt Tree shop. Brittany makes custom orders in addition to her available garlands! The floral Minnie Mouse headband on E is from the Ella Reese Designs. Such cute headbands and clips for littles and adults! I made the paper wheels using this tutorial. I just added a couple Minnie Mouse faces and purchased the paper from Hobby Lobby. This GORGEOUS floral E was made by Quinntessential Floral Designs. She will be adding the 18" letters like this one to her shop soon in addition to the 26" ones she has currently. Her pieces are so stunning! You NEED to check out her Etsy shop! I borrowed the gold chargers from my Mother-in-law, but she purchased them at Pier One Imports. I also loved getting to use John's Grandma's china! It was really special and matched the theme perfectly. All of the flowers and greenery are from Hobby Lobby! I just cut them up and placed them on the tables separately. 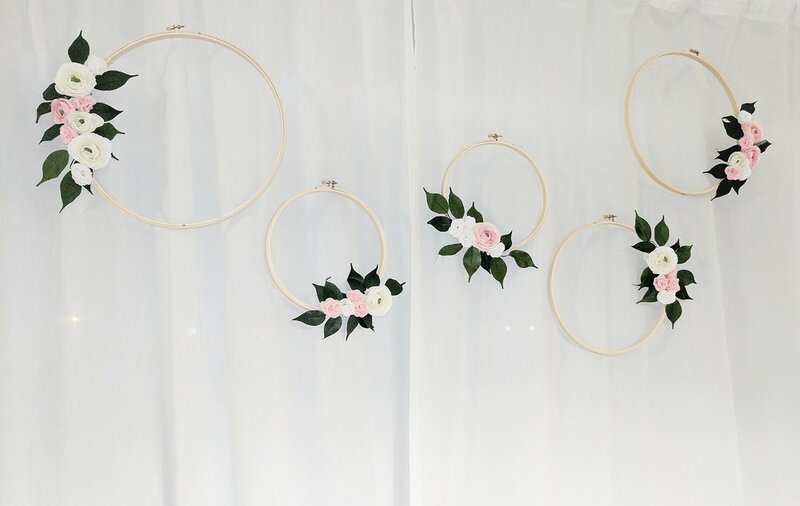 The embroidery hoops and fake flowers/greenery are all from Hobby Lobby too. It was so inexpensive to make and turned out to be so pretty! I hung them from our curtain rod with string. I used the left over flowers to decorate the cake. I cut out two paper circles for the Minnie Mouse ears, and used my favorite cream cheese frosting recipe with a strawberry boxed mix! Such a special night for our sweet girl! The birthdays and holidays seem to get more fun as they get older. We are so incredibly blessed!